Although the Atlantic was first crossed by aircraft in 1919, it took another 11 years before the first pilots ventured to Bermuda—a spot deemed too dangerous to fly to by early aviators because of the island’s lack of radio aids to navigation. But the challenge to reach Bermuda eventually proved irresistible to early barnstorming pilots. Aviation historian C.V. Glines has celebrated the exploits of the three men who first reached Bermuda by air in a perilous hop-skip-and-jump flight aboard a small Stimson seaplane [pictured above, after landing in Hamilton Harbour]. The flight paved the way for the flying boats which brought wealthy tourists here in the 1930s and the island’s post-World War Two boom as a commercial aviation hub. World War One combat ace William H. Alexander, accompanied by former US Navy Captain Lewis A. Yancey, an experienced navigator, and Zeh (Jack) Bouck, a radio operator, made the inaugural flight to Bermuda in 1930 under a veil of secrecy. “Unlike most of the participants in record-seeking flights of that era, the three intrepid airmen tried to plan their trip secretly, because they wanted to be first,” said Mr. Glines. “They quietly sought sponsors to finance the flight, but many in whom they confided advised them not to attempt the trip. If they missed the main island and kept on flying east, it was thousands of miles to the nearest land. Besides the honour of being first, there was at one point a monetary incentive for anyone who would succeed in a flight from the United States. Hoping to stimulate tourism, the Bermuda Trade Development Board offered a $25,000 prize to anyone who would fly from the US mainland and land in the harbour, thereby opening up the British dependency to air travel. 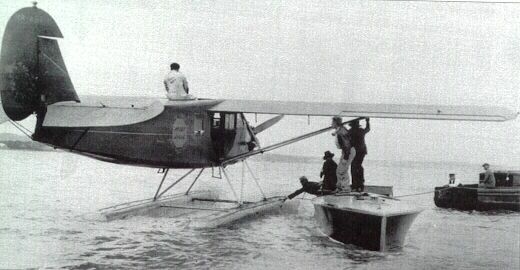 Eight hours after take-off, the seaplane was running low on fuel and set down in the open seas 60 miles north of Bermuda. The crew planned to finish the flight the following morning rather than risk a night landing. After taking off again the next day, the crew “had sighted Bermuda dead ahead,” according to Mr. Glines. “Shortly after, the trio saw Hamilton’s white buildings glistening in the bright sunlight, however, the fuel factor caught up with them … [the] engine suddenly sputtered and died. Alexander had to make a forced landing only 10 miles from the North Shore. The plane was sighted by a watcher at the marine pilot station on St. David’s Island, who immediately dispatched two members of the station in a motorboat to greet the embarrassed Americans. When they learned that the plane needed gas, they returned with several cans. Bermudians feted the fliers’ achievement and the Trade Development Board—which had withdrawn the $25,000 prize money for a flight to the island—voted to give $1,000 to each of the three aviators.